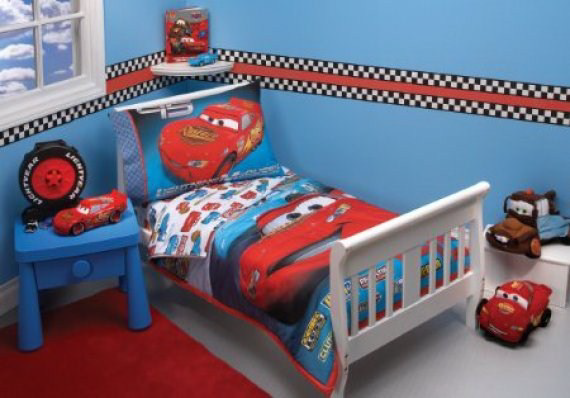 If your little guy loves Disney's Cars or wants a car room more than anything else in the world, then just remember it's all about the car bed. You can paint, add fun decals, Disney bedding and even cool new toys but you will never get the WOW factor from your excited youngster without giving him his very own bright red car to snuggle up in each night. You may even find he can't wait to go to bed. It's simply all about the Car bed! I love this Step 2 red convertible from Sears. This bed size changes from a toddler bed to single bed, includes silvertone rims, realistic decals and even comes with working headlights that have a 15-minute auto shut-off feature. Fits a crib or twin mattress. The next great thing about our car Peek-a-Room is the fabulous accent coloured wall. Match your furniture and headboard wall colour, it can be a shade lighter than your car or even an accent colour from one of your car's decals. Make it bold and remember to use low VOC paint. No great car bed can run without gas. This little gas pump from Restoration Hardware will look great in your car Peek-a-Room and your little guy's imagination will run wild. Another fun idea is a chest of drawers painted and decaled to look like a cool tool chest. In this car Peek-a-Room, the large wardrobe can be easily copied with a free standing Ikea wardrobe that is trimmed and painted in your accent colour. To finish it off add a large Disney's Cars decal and for safety attach it to the wall. The end tables and cute desk are simple box builds with white tops and accent coloured sides and bottom shelves. Tip: You may want to just paint your furniture fronts in your bold accent colour and keep the sides neutral. This will make it easy to change up the room to fit your little guy's next dream room. The bedding and walls in this car Peek-a-Room are done in a light gray/beige that will easily grow with your child's style and keep this fun bedroom from feeling too overpowering. Add some crazy floor cushions for seating, a neutral area rug, a couple of basic white lamps and then get ready for all the neighbour kids to come over and play. If this car Peek-a-Room is your vision or if you have a Peek-a-Room vision of your own that you love, but just don't have the time to tackle the DIY and all the shopping and selections, give us a call at (604) 374-2336 and ask for our Design Alley Kids Room Special! Newer PostPeek-a-Room Blog — Welcome to Wonderland!